of the Balalaika Ensemble QUARTET "SKAZ"
News of the site: Added: On a page "MUSIC" Russian Valtz (1945); Guitar-Vocal Valentina SOBOLEVA-BELINSKAYA Russian song Page on BEADS-Hobby Valentina Soboleva-Belinskaya (links at the top); Page "OUR SOLO MUSIC" - record balalaika solo and domra solo; VIDEOpage "SKAZ". On the page "Music" added plays: American March Russian composer Vasily Andreev; Charles Chaplin "Eternally", music from a Film; REGTIME DANCE, Scott Joplin (mp3); Russian nirvana "Ah, Samara-gorodok"; "Nedelika" - in stiletto disco-rock. It is the old address of a site. "Professional group - Russian concert Balalaika QUARTET "SKAZ", Moscow is one of the brightest and prestigious musical ensembles in Russia. The young ensemble organized in 1973 from the very first performances has appeared as perspective talented collective, the active propagandist of Russian national and classical music. 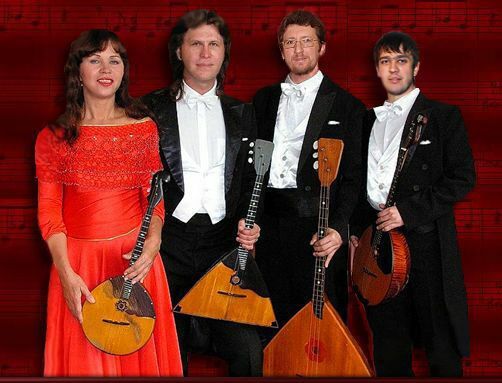 The members of the QUARTET "SKAZ" playing Russian Folk Instruments are dedicated to the promotion of Russian Folk music throughout the world. 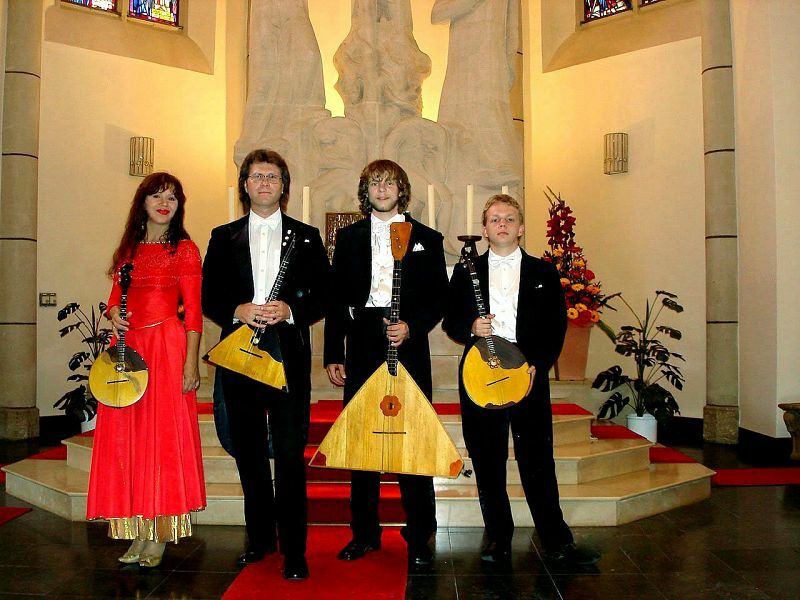 The members are dedicated to making serious as well as light music on stringed instruments the balalaika and domra. "SKAZ" is such a group and has been described as phenomenal since they have managed to capture attention by the unique sound, which they originated on the balalaika and domra. The members succeeded in the improvement of the old technique of playing - by the skilful adoption of the proven and expert methods used by exponents of the banjo and classical guitar. 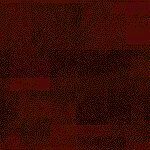 In this manner "SKAZ" could perform more expressively and also acquired an additional timbre in sound. A direct result of their improved technique was the considerable expansion of the quartet's repertoire to include classical music and jazz - in addition to the customary and traditional Russian folk songs and dances. Their repertoire also includes folk dances and songs from other cultures from over the world as well as music which was specially composed for them. Russian concert QUARTET "SKAZ" - the author of many share records on radio and TV in Russia, and also seven solo plates and a compact disc issued in Holland. In 1994, in Budapest, together with a summary symphonic orchestra of executors from Germany, USA, Hungary, quartet "SKAZ" has written down music to a film "Ekaterina Great" (manufacture USA - GERMANY), and in 1995 - music to a film "Young Indiana Jones, Travels With Father", composer Laurence Rosenthal (USA). The group travels regularly. No matter whether the perform in small hall, on fashionable concert stage, or on a stage at a building site in a distant Siberian town the quality of their music is always highly commendable and their inspiration and concentration evident. In the program: popular classical music, original compositions and processingТs of Russian national melodies, melodies of the countries of the world, city romances, ragtimeТs..."
artists of the quartette was partly changed. which there is in his shower." promotes the flight of the imagination..."